Owning and renting property is one of the best investment strategies for building long-term wealth. Besides the money needed to purchase the property, what holds most people back is the fear of dealing with bad renters. It’s not a misguided consideration either. Take it from someone who knows – bad renters can be awful. With that being said, in my five years of owning rental property, I’ve only had one bad renter who forced me to take legal action and pursue an eviction. I attribute that success to the process whereby I select tenants for my properties. I live by the adage that the best place to catch potentially bad renters is before they sign on the dotted line. What can a landlord do to screen out a potentially bad renters? Here are six things I’m doing that may seem obvious but are often not followed. It’s tough to have a property sit vacant without so much as a nibble from a prospective tenant. If that scenario continues for several months, desperation sets in, especially if the property has a mortgage. Faced with the possibility of indefinitely paying the mortgage out-of-pocket, landlords can make the mistake of taking anyone who comes along just to get someone in the property. This emotional decision is not based in good business practice. It would be better to let the property sit than to let the emotion over lost income rule your decision about who resides in the property. It should be obvious that the prospective tenant should fill out an application. But are you requiring them to pay an application fee? If so, is it non-refundable? I require my applicants to pay a $35 non-refundable fee in order to process their application. You may call that a “greedy-landlord-getting-all-the-money-he-can” practice. I call it absolutely necessary and the first big test in the screening process. Here’s why. b) collecting a full months rent from them later is going to be a challenge. By the way, I put that non-refundable fee to good use to pay for a service that conducts a background and credit check on the applicant. That’s why it’s non-refundable…I actually use the money on the business. Conducting a background check will tell you what criminal record, if any the applicant has. If this person is going to be living in your property, you have the right to know what run-ins they’ve had with the law. You also should know to whom else they owe money. Someone with poor credit due to negligence in paying off debt represents a big risk when it comes to paying rent on time each month. If this seems intimidating, there are services to help you with this process. I have used an online service at E-renter.com with great success. They allow me to set my own parameters for the type of tenant I want. The report they generate informs me whether or not the tenant met my predefined set of standards. In the old days, I’m sure you could spit-shake and have a gentleman’s agreement on what the rental terms would be. Unfortunately those days are long gone. Having a detailed lease agreement that spells out the responsibilities should be done whether or not the applicant is someone you know. Lease agreements act like an accountability partner and that’s good for both tenant and landlord. The tenant knows what is required of them as they reside at the property. Conversely, by signing the agreement, the landlord guarantees he or she will follow certain behaviors. If either party falters on their obligation, they can expect to be called on it…even by a judge. That’s right…the judge is going to want to see the lease agreement terms if there ever is a dispute in court. If you don’t have a lease outlining responsibilities, the matter in dispute will become a “he-said, she-said” battle in which you’ll have no supporting documentation. Again, there are many samples of rental agreements that you can find online. Some are available for purchase and they vary from state to state. Make sure to know the laws for your particular state before putting one in use. On the application, I have the prospective tenant list their employer’s contact information so I can call them to verify that they are indeed employed. Yes, people do lie about that on their application. I also have them list their salary. I try to verify that salary on the phone call with the employer, although some are hesitant to hand over that information and certain H.R. departments are hard to reach. What I’m targeting with salary are tenants whose rent payment will be no more than one-third of their take home pay. Finally, have multiple conversations with the applicant in person and over the phone. You can get a real sense for a person by looking them in the eye and listening to them talk. I commonly ask about their current housing situation, what they are looking for in a rental, and their intentions on length of stay. I also look to see how they respond. Are they engaging? Respectful? Asking questions of their own? All this interviewing may seem odd, but I’m simply trying to piece together this puzzle so I can make an informed decision. On more than one occasion after such conversations, I’ve developed a gut feeling that the applicant wasn’t a right fit. This feeling would not have come if I hadn’t talked to them. So much can be done up front to filter out potentially bad renters. The key is to have a plan in place and implement it from the first contact you have with the applicant. It will save you time, money and headaches in the long run. Questions: What other practices can you think of to weed bad renters? 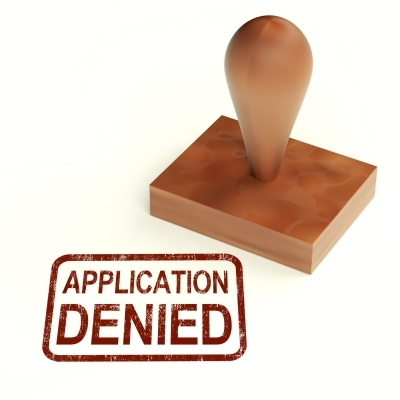 Have you ever accepted a less than stellar applicant out of desperation to fill a vacancy? My wife and I also own a few rental properties. A few of them have sat vacant for months before getting a qualified tenant. During that time it is hard not to take the next guy who seems decent. We have found that one of the best qualifiers, as you mentioned above, is to ask for a non refundable application fee. Our price is a little higher than $35, but we’ve found that if they are serious, they will pay the fee without even flinching. The prospective tenants who find it hard to come up with that money are the ones that will find it hard to come up with the monthly rent as well. There is something powerful about the words “non-refundable” that keeps some people from committing. I set my price at $35 because that’s what it costs me to do the background and credit check. I’m not really looking to make money off the application process. But I do want someone qualified who doesn’t mind forking over that amount. It’s a good sign, like you said, they will find have the money to pay rent later. Thanks for the comment. Hiring an agent is a great service for people who want to put some distance between themselves and the property or who don’t have the time to manage it. Coming from a tenant’s perspective, when we signed our extended lease agreement with our current landlord, I appreciated that they had a high standard when deciding who to rent their property to. On our end, we filled out all the paperwork they requested and even provided bank statements to back up our monthly cashflow. I also drafted a letter stating how long we’ve both been at our current companies (over 6 years each) and how much our salaries are. I showed how the monthly rent would be less than 20% of our monthly salary plus we also already had more than a year’s worth of rent in one of our savings accounts as a reserve. We both also have impeccable credit scores. We used this to negotiate a slightly lower rental rate (about $50 less each month) but extended the lease agreement to 36-months. That way, they had dependable cashflow for the next 3 years with ideal tenants. It was a great win/win for both sides. We love our place now and we knew that showing how this could be an ideal fit on both sides will indubitably get us the place we want at the price we wanted to pay. Ultimately, I’d like to think that good people attract good people, so that is probably also a good reason why you’ve been so lucky with your tenants! Anything you can provide for the landlord in regards to ability to pay is a bonus in your favor. And I’ve extended terms before and lowered rent for the security of locking someone up for more than a year. I agree…it’s a win-win. I had not heard of e-renter.com but definitely seems like a good site for landlords. We wrote a lease agreement for both of the renters we’ve had and I agree that it really does set expectations for both renter and landlord. I can’t imagine renting without one. The service at e-renter.com has helped us and is well worth the $35 we pay for it. We have one rental and had three bad tenants. The first couple were our friends, and they felt that they could pay whenever they wanted to. Our second tenant had a teenager who was on drugs, and when they moved out, everything that could be damaged was damaged. It was a very expensive lesson for us. Our third tenant was a loan officer and got caught in the housing crash, and no one taking out loans. Fortunately, he moved out without incident. All three had poor credit and we felt sorry for them. We have always tried to be good landlords, fix things right away, and we never raised the rent. We naively thought that our tenants would appreciate that and in turn pay us on time and be long term tenants. Nope. New philosophy: We charge the highest rate at the get go. We only accept tenants with excellent credit. Because we have excellent credit, I know how I stress over paying the bills on time, so my thought is that people with high credit will pay the rent if they possibly can. And we will never raise the rent. Now we’re all happy. Also, I like to use Clear Now. They electronically debit the tenant’s account every month, so that we don’t even have to collect rent. I like the new philosophy, although I would still raise the rent after each term, even if I’m at the top of the market as far as rates go. Even if it’s as little as $10, I want to keep moving forward a little in the amount of money I’m clearing. A bad tenant would be one of the worst possible experiences and that’s exactly why we have property management right now. We are still on our first set of tenants, who showed up drunk on move in day! After that fiasco, property management told them to shove off. They came back to apologize. The property manager called everyone again to confirm that they had been good tenants in the past, so we made the call to let them move in. In hindsight, that could have been a really bad move, but they have been great ever since and that was a year and a half ago. I guess anyone can make a wrong choice on the wrong day, but if they hadn’t been vetted so carefully, I would have not given them the chance. Talking with their previous landlord was very helpful, so I’d add that if possible. There are a great many advantages to using a property management firm, including dealing with situations like the one you mentioned. Being a landlord can be a very emotional experience and having someone else on your side can be a great benefit. I don’t currently have a rental property, but I hope to in the future. I’ll have to bookmark this post for then! Great tips. Thanks! I’ve written several other really informative posts on my experiences. You can find them on the “Real Estate” tab in the main menu. These tips are great! Avoiding accepting a tenant based on the emotional challenge of not having anyone helping pay that mortgage. All of these points really clarify the need for a landlord to think logically, and not just react when a possible solution comes around. Exercising those reason skills can really save you time and money down the road! Couldn’t agree more Leonard. Letting one’s emotions get out of control is a sure fire way to make some silly decisions. All awesome tips, Brian. I especially like the step of verifying employment. I think that’s the one piece of data I really care about: with an income, rent can be paid. We’re considering buying a rental property or two this year, and will be utilizing a property manager. I’ll be sure that these steps are part of their process. Thanks! I pay big attention to the income numbers. So talking with the employer and former landlord if they have one are both really big deals to me. Great tips, Brian. We don’t own rental property but I do agree that if it’s something you need to understand and be prepared to handle. “Lease agreements act like an accountability partner and that’s good for both tenant and landlord.” – so true and it is definitely good protection for both of you. While nobody likes paying fees, in some ways, as a potential renter, I would also find it comforting that you charged an application fee, etc. These are things big rental properties do and it would make me feel like you took your rental property seriously, meaning you maintain the property well and will respond quickly when something breaks. Lots of owners have horror stories of bad renters but it goes both ways. I paid the fee to an agency so they could screen me, however, I would second guess paying it to a private landlord, although that completely makes sense and probably auto selects the best tenants. I rent by the room so I have the other roommates conduct a small interview to see if the new person could be a good fit. I’m up front with the applicants about the non-refundable fee so they know what it goes towards. Once they realize what I’m using it for they are more accepting of it. Great post! We are eight years into owning our rental properties and have only had one problem tenant. He completely trashed our house and it took over $6,000 to fix everything he ruined. Fortunately, he did not want to be sued and paid us back for most of it over 18 months through a payment plan we set up. It was such a huge pain! You were fortunate he agreed to and followed through with your payment plan. Even though that was probably bothersome to handle it that way, it saved you going to court…which is the bigger headache. I’m curious to know how you’d handle someone with great credit but someone who is self-employed like myself. I’ve never had to look for a new apartment because I started living in my current place when I was working full time, but that makes me nervous about ever having to get a new apartment. Does it help that I’ve lived in my current location for over 5 years? I’m just wondering how I need to prepare myself. “self-employed”…That’s a tougher one. I’ve never received an application from someone who is self-employed. I would probably ask for some verification that you were making what you were saying and maybe a list of clients you’ve done business with who could vouch for bills you’ve paid. And yes…it does work in your favor that you have lived in the same location for 5 years. You could use your current landlord as a reference. They could vouch for the fact that you’ve paid rent on time. That would be a big deal to me to hear that from a fellow landlord. That’s cool you’ve had to deal with only one problem tenant. I remember renting and always hated paying those non-refundable fees, but I totally get why you need to use them, not to mention the fact that you pay for the background checks. You may have mentioned this in past posts, but do you have a management company handle maintenance issues, or do you handle that yourself as well? I’m handling the maintenance requests but I don’t always do the work. Depends on the particular issue and the size of the project. I’d rather hire a professional in most cases as my time is better spent elsewhere (family, full-time job). It’s taken me some time and trial and error with different businesses but I have built a pretty good team of companies to call on if I have any issues.